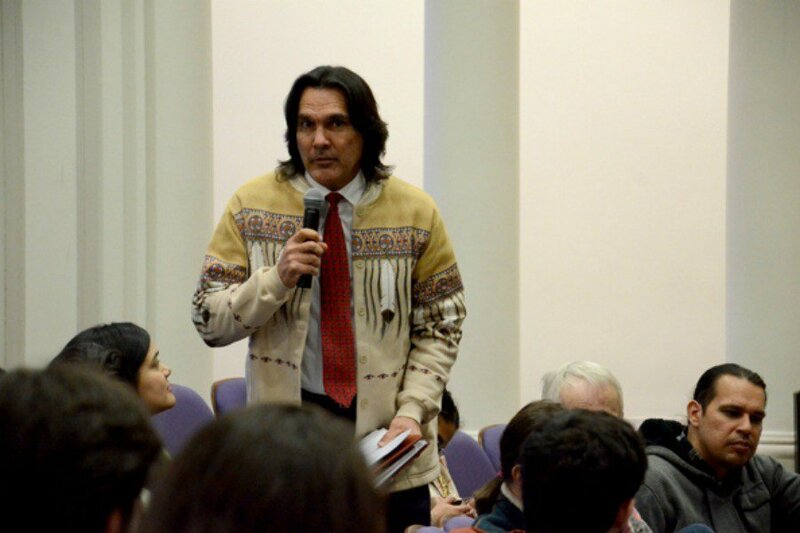 Andrew Johnson, executive director of the American Indian Center of Chicago, speaks at the Native and Indigenous Northwestern Community Forum in 2014. The new Native American and Indigenous Studies Center at Northwestern will collaborate with organizations that serve Native American and indigenous communities in the region. Northwestern will create a Native American and Indigenous Studies Center using a $1.5 million grant from the Andrew W. Mellon Foundation, the University announced Saturday. The five-year grant — starting in April — will help fund a center that will host grants and fellowships for students and faculty, lead projects and host artists and visiting scholars, a University news release said. In October 2015, the University cancelled a plan to establish such a center — despite reserving the funds months earlier — and instead launched an Indigenous Studies Research Initiative, which added faculty in Native American and indigenous studies. The new faculty, in addition to the grant from the Mellon Foundation, formed the foundation for the center, said Ann Bradlow, Weinberg’s associate dean for academic initiatives. “We’ve constantly trying to build on what we’ve had and enhance it and keep it going, and that’s what’s exciting about this new award,” Bradlow said. Bradlow said the University applied for the grant in Fall Quarter and received the funding in December. The funding will allow for Native American and indigenous studies to solidify more deeply in NU’s academic culture, Bradlow said. The announcement comes more than two years after the University’s Native American Outreach and Inclusion Task Force recommended Northwestern establish an Indigenous Research Center. In its report, the task force endorsed a center with an emphasis on hiring Native American scholars and establishing partnerships with Native American educational institutions. The task force, which originally recommended the center, was established after pressure from Northwestern’s Native American and Indigenous Student Alliance to investigate NU founder John Evans’ role in the Sand Creek Massacre, in which about 150 Cheyenne and Arapaho people were killed. While a separate committee focused on Evans’ role in the massacre, the University established the task force, which also recommended the University rename programs and buildings named after Evans. Ninah Divine (Weinberg ‘16), a former member of NAISA who is Cherokee, highlighted the importance of creating a space for Native people within the greater context of an American academic institution. “Typically, academic institutions reinforce colonial settler values and operate in spite of Native people on their land, teaching counter to their ways of thinking and (ways of life),” she said. Divine also discussed her work in forming a research grant that will allow Northwestern students to study at tribal colleges and universities across the country. She hopes that once the center is well-established, it could assist in spearheading this initiative. Ann Bradlow, Weinberg’s associate dean for academic initiatives, said in the news release that the center will establish NU as a “hub” for scholarship about Native American and indigenous studies. The Mellon Foundation, which offered Northwestern the grant, had a total endowment of about $6.1 billion by the end of 2015 and gives about $209 million in grants annually. The funds originally allocated to establish a center in 2015 were shifted toward establishing the Indigenous Studies Research Initiative. As part of the initiative, which is within Weinberg College of Arts and Sciences, the University hired three new assistant professors and a postdoctoral fellow. Lorenzo Gudino, president of NAISA and member of the Fort Sill Apache Tribe, plans to create a meaningful connection between NAISA and the center. The Medill senior said the group plans to discuss possible steps toward this relationship as soon as members are back on campus for Winter Quarter. Divine, who is a coordinator of the Native American and Indigenous Peoples Steering Group, said the center is by no means a cure for the injustices inflicted upon Native peoples. But Divine believes the establishment of the center is a step in the right direction. “What this says is that we can put our money and our resources towards making a positive impact in Native communities,” she said. This story was updated to include an interview with Ann Bradlow.